After you give us an official confirmation, we'll take your branding assets (logo, background colour, photos, etc. ), and customise the TrainerFu experience as per your branding. We'll do multiple iterations till you're finally happy with a version. NOTE: Due to recent changes in Apple's Developer policy, we're unable to push custom-branded apps from our developer account. Therefore, to publish your app on App Store, you might have to go through an additional process of creating an Apple Developer account (yearly subscription costs $99/year). Once your app is live, you can ask your clients to download the custom-branded app directly by searching on Play Store & App Store. You can also ask your clients to download the custom-branded app directly by sharing direct download link (we'll be emailing you). After the app is downloaded on their phone, they just need to login with their client credentials (the same they had on TrainerFu). And that's it. They can now start logging their workouts from their smartphone. 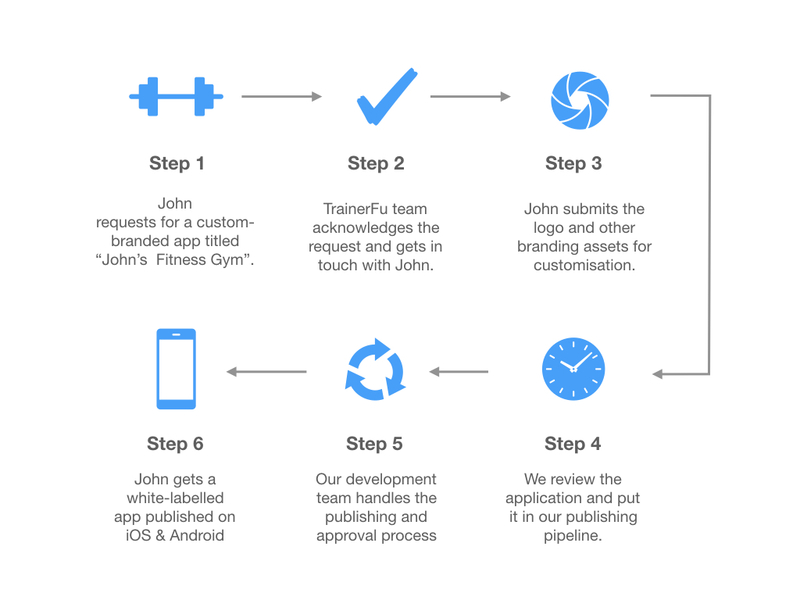 All the powerful features we build on TrainerFu would be ported to your custom-branded app for FREE. Our team will manage any bugs/issues and provide complete support for the custom-branded app. Any customisation to branding assets, after the custom-branded app has been published on App Store and Play Store, would be accepted only on a request basis. Please write to us: support@trainerfu.com, if you have any questions on app customisation. Please feel free to send us email at support@trainerfu.com, if you would like to know more about custom-branding.